The first act? I can’t tell you much about it…or at least nothing more than you can read in a synopsis. Having arrived a moment or two late due to a misunderstanding of the address, my friend and I were informed, in no uncertain terms that, due to the setup of the theater, we would not be let in until intermission…over an hour later. Thankfully, we found Vyne, a lovely wine bar, with even lovelier hand-cut french fries about a block away. Beautifully golden, crispy, perfectly salted french fries…put us in a much less ornery mood. After an appropriate fix of salt and carbs, we returned early to the theater to make sure that we wouldn’t get shut out again. When the doors opened, and I explained (again) that I was there to review the show, we were passed from confused usher to confused usher until we finally found the executive director of the theater company who informed us that our reserved seats had been given away. Growl. However once we were found new seats, and the show began, I was swept away into another world entirely. Tony Award Nominee Mary Testa, is intoxicating in a role that LaChiusa says he wrote with her in mind. (Imagine, a fabulous, meaty role for a non-20 something woman!) Even having missed the first act I had absolutely no difficulty being sucked right into the storyline. The long thin set is as much player as the 7 actor cast themselves, keeping the audiences gaze moving from upstage to downstage and back again as Taylor’s life unfolds. I must say, even after the abortion of the first act, I was completely enraptured by the innovative score and the power of the leading lady and her supporting cast. 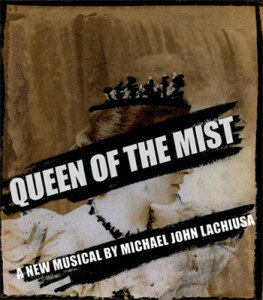 This entry was posted in Discount Codes, NY and tagged date night, john cummings, Maid of the Mist, MamaDrama, mary testa, michael john lachiusa, mom's night out, nyc, Queen of the Mist, Theater, Theatre by jessica. Bookmark the permalink. We at Transport Group are thrilled to hear how much you enjoyed Act 2 of our show! We do hope you’ll come back to catch Act 1 and experience the full flavor of what QUEEN OF THE MIST and its very talented cast, orchestra, and creative team have to offer. As you know from having been in the theatre on Monday night, the configuration of the space (the audience enters the theatre from backstage and must walk ONTO the stage to get to their seats) and the constant movement of actors on and off stage throughout the show do not allow any possible way to seat patrons once the show has started. This would not only be dangerous both for the patrons as well as the actors, but would be impossibly disturbing to the entire production for a late audience member to walk in full light and full visibility across the playing space! This of course is simply impossible and completely absurd to even consider. It is unfair of you to fault Transport Group for the practice of “no late seating” — it’s out of necessity to the integrity of the performance that we have this policy. Late is seating is literally impossible. In addition, since the majority of our seating is General Admission, when there are no-shows at the top of the show, we always remove reserved signs off the seats for 2 reasons: 1) so the entire cast and audience isn’t looking at empty seats in the front row that say “Bernstein” on them, which is distracting both to the audience and to the actors who are in close proximity to each other and 2) since most of the theatre is General Admission, other patrons are permitted to sit in seats without reserved signs on them, and it’s a standard good practice for any live performance to want to fill the front rows first. We had perfectly fine seats available for you of course upon your arrival, but having now seen the space, I’m sure you understand why we wouldn’t keep 2 seats with your name on them sitting empty in the front row. Again, it seems unfair to fault Transport Group for this. In spite of the above, I believe our staff treated you graciously and with concern, and that you had a very nice experience in our theatre while you were there. Anytime you would like to return to see the entire production, please let us know and we’ll once again hold 2 seats in the front row for you!